Charles of Orleans in The Tower of London, from "A Volume of Poems of Charles of Orleans and Other Works"
bl.uk > Online Gallery Home	> Online exhibitions	> Illuminated manuscripts	> Charles of Orleans in The Tower of London, from "A Volume of Poems of Charles of Orleans and Other Works"
A depictment of the imprisonment of Charles, Duke of Orléans in the Tower of London. 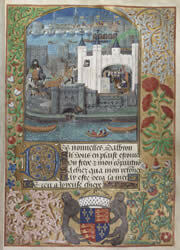 An illuminated folio from a manuscript of poems written by Charles during his imprisonment. Charles (139?-1465) was kept prisoner for 25 years (1415-1440) following his capture at the battle of Agincourt. Charles is shown standing at a window in the Tower and dispatching a letter from the courtyard. London Bridge is shown in the background.